Great experience. Best way to buy a dress! Maggie Sottero Carolina dress Size 8 however has been altered so would best fit 6-8 DISCONTINUED dress! 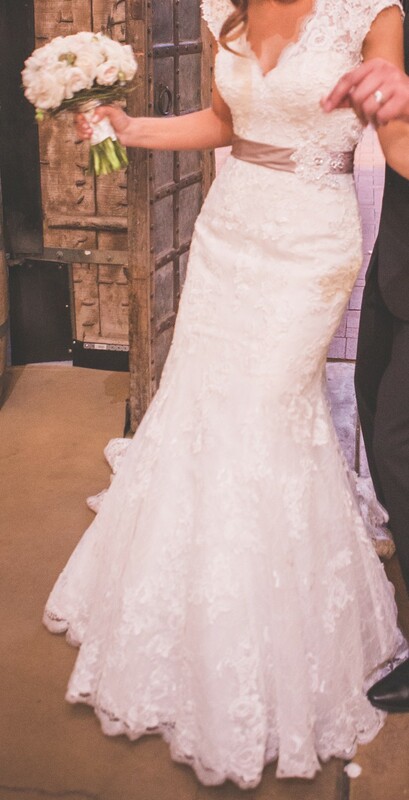 A distinct, scalloped, illusion V-neckline and cap-sleeve bodice create an allure about this gown that draws one in. Lace and tulle, together with Romance Satin, fall to the hemline gracefully showing off lace motifs along the way. Finishing details include key hole back and zipper closure.